Multix Non Stick Alfoil is strong & reliable. Size: 10m x 30cm wide. Multix Non Stick protection stops food damage. Keeps your BBQ grill and hot place clean and helps prevent food from over cooking. 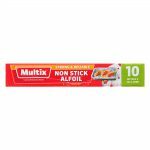 For storing food, allow to cool before covering with Multix Alfoil Non Stick. Use the dull side of Multix Alfoil Non Stick for non-stick benefits. Do not use Multix Alfoil Non Stick in a microwave. Always read your oven user manual before lining over walls with Multix Alfoil Non Stick. Do not cover stainless steel dishes with Multix Alfoil Non Stick.